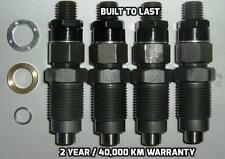 DIESEL FUEL INJECTOR SET MITSUBISHI DELICA/SPACEGEAR 4M40 / 4M40T 2.8L. DIESEL FUEL INJECTOR SET MITSUBISHI PAJERO TRITON 2.5 4D56 4D56T.NEW. Mitsubishi Lancer. Fuel Rail Spacers. 2 x Fuel Rail Spacers. Evolution 4 5 6 7 8 9. Mitsubishi Service Parts (255). We are specialists in Subaru UK & JDM Models, but cater for all japanese car manufactures like Nissan, Toyota, Mitsubishi etc. Mitsubishi L200 Fuel Injectirs And Rail. Condition is Used. Dispatched with Royal Mail 1st Class. 1996 - 2006 MITSUBISHI L200 2.5TD. NEW 100% GENUINE MITSUBISHI DIESEL/FUEL INJECTOR NOZZLE WASHER SEAL SET. 4x INJECTOR NOZZLE SEALS/WASHER WHERE THEY FIT IN THE HEAD. THIS NOZZLE WASHER SET INCLUDES. MITSUBISHI SHOGUN 2010. Make / ModelMITSUBISHI SHOGUN. On average these parts have covered 30,000 miles. Part also fits. MITSUBISHI EVOLUTION 4 5 6 7 8 9 INJECTORS PERFECT WORKING ORDER. MITSUBISHI EVO 4 topfeed 510’cc yellow injectors. REMOVED FROM A 2005 2.0 TD MAZDA 6 ENGINE CODE: (RF5C) 136 BHP. MITSUBISHI SHOGUN Injector Pump (High Pressure). SHOGUN 2000 - 2006 3.2 Diesel Engine. MITSUBISHI SHOGUN Injector Pump (High Pressure). SHOGUN 2000 -2006 3.2 Diesel Engine. 2003 MITSUBISHI SHOGUN which we are dismantling. Style Station Wagon. The Part imaged and described is th eactual part you will recieve. MITSUBISHI SHOGUN Injector Pump (High Pressure). SHOGUN 2000 -2006 3.2 Diesel Engine. 2006 MITSUBISHI SHOGUN which we are dismantling. Style Station Wagon. The Part imaged and described is th eactual part you will recieve. MITSUBISHI L200 MK4 2.5 DI-D DENSO INJECTIOR RAIL. OTHER PARTS AVAILABLE IN OUR. MITSUBISHI SHOGUN Injector Pump (High Pressure). SHOGUN 2000 -2006 3.2 Diesel Engine. 2004 MITSUBISHI SHOGUN which we are dismantling. Style Station Wagon. The Part imaged and described is th eactual part you will recieve. Fuel type: Petrol. 2005 MITSUBISHI LANCER Injection Rail. This item has been removed from a: 2005 MITSUBISHI LANCER. Model: LANCER. Part Type: Injection Rail. Make: MITSUBISHI. Vehicle Colour: Silver. OLD FORGE ENGINE CENTRE LTD. Whilst every effort is made to ensure that parts are despatched in good working order, problems and faults do occasionally occur. In this instance we will endeavour to replace a faulty part. SHOGUN 2007 -2015 3.2 Turbo Di Diesel 4M41. MITSUBISHI SHOGUN 2011. Make / ModelMITSUBISHI SHOGUN. On average these parts have covered 30,000 miles. Part Number 1465A189. EXO X Fuel Rail. 2001 MITSUBISHI SHOGUN PININ MK1 2.0 PETROL 16V GDI (4G94) INJECTOR PUMP (HIGH PRESSURE) MD367150 TESTED GOOD RUNNER . THIS ITEM IS A USED MITSUBISHI SHOGUN PININ 2.0 PETROL 16V (4G94) HIGH PRESSURE FUEL INJECTION / INJECTOR PUMP, REMOVED FROM A 2001 MITSUBISHI SHOGUN PININ ELEGANCE GDI. 2003 MITSUBISHI SHOGUN. SHOGUN 2000 -2006 3.2 Diesel Engine. Injector Pump (High Pressure). Our site is spread over 5 acres consisting of a reception area, two large storage buildings, de-pollutions bay, vehicle racking facility, in house crushing/bailing zone. Mitsubish Shogun Pinin. All vehicles that we break are RIGHT HAND DRIVE. Shetland ZE1-3 | Inverness - ALL. We appreciate Your decision to buy from us and. Mk3 3.2 Diesel - Injection Rail - Engine code 4M41T - In Good Working Order Removed From A Running Vehicle. Mk3 LWB DI-D 3.2 Diesel Auto. Injection Rail. This part was removed from a Right Hand Drive Vehicle. MITSUBISHI LANCER GS2 2008 1.8 PETROL. REMOVED FROM A MITSUBISHI LANCER GS2 2008. INJECTOR RAIL AND INJECTORS. THIS IS IN GOOD CONDITION AND FULL WORKING ORDER. AB, BT, HS,JE,KA, KW, PA, IM, IV, ZE. Item Specifics:2004-2014 - 1.1 PETROL - FUEL INJECTION RAIL - WITH INJECTOR - 2 PIN EACH. COLT 2004 -2014 1.1 Petrol. Part:Injection Rail. This Injection Rail was removed from a2005 car and has been fully inspected. CARISMA 1995 -2004 Mk1. Item Specifics:1996-2004 - MK2 - 1.6 PETROL - INJECTION RAIL - WITH INJECTORS - 2 PIN EACH. Part:Injection Rail. This Injection Rail was removed from a2004 car and has been fully inspected. We are a bonefide 'End Of Life' Vehicle Dismantlers situated in East Devon. We also boast an extensive used car parts centre. THIS ITEM IS A USED MITSUBISHI SHOGUN PININ 2.0 PETROL FUEL INJECTION / INJECTOR RAIL WITH PRESSURE SENSOR. REMOVED FROM A 2001 MITSUBISHI SHOGUN PININ ELEGANCE GDI. 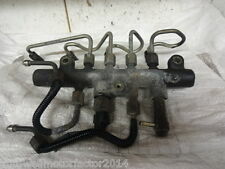 2001 MITSUBISHI SHOGUN PININ 2.0 PETROL FUEL INJECTION / INJECTOR RAIL WITH PRESSURE SENSOR PART NUMBER MR560127. MK3 Warrior LWB 3.2 DI-D Auto. 3.2 DI-D Diesel - Automatic - Fuel Injection Rail Pipes - In good condition. Injection Rail. This part was removed from a Right Hand Drive Vehicle. Compatibility is a guide only. Mitsubishi Shogun Pinin 1.8 GDi 2001-2006/07 petrol. Fuel Injector rail and pressure sensor. Out of hours collections can be also arranged by prior notice. REMOVED FROM A 2011 MITSUBISHI ASX 1.8 DiD. ASX 2010 -2018 Mk1. Item Specifics:2010-2018 - MK1 - 1.6 PETROL - FUEL INJECTION RAIL - WITH INJECTOR. Part:Injection Rail. This Injection Rail was removed from a2011 car and has been fully inspected. MITSUBISHI L200 DID 16 VALVE DIESEL 4D56U FUEL RAIL WITH SENSOR 2006 ONWARDS. MITSUBISHI L200 WARRIOR DID Diesel/Pickup 4/16 DOHC All-wheel Drive 4D56U 11/05-. MITSUBISHI L200 ANIMAL DID Diesel/Pickup 4/16 DOHC All-wheel Drive 4D56U 11/05-. Item Specifics:2013-2015 - 1.2 PETROL - INJECTION RAIL - WITH INJECTORS - 2 2 2 PIN PLUG - PART NO 1465A331. MIRAGE 2013 -2015 1.2 Petrol. Part:Injection Rail. This Injection Rail was removed from a2014 car and has been fully inspected. Mitsubishi 2.8 Diesel. GLASS AND BODY PANELS. You must check to make sure this item fits your vehicle. Hooton 4x4. before purchasing. SECURITY MARKS. to make a claim against them. PART NUMBER : A6390701195. OUR REF MA571. F9Q1 1.9 DCi 0445110021 / 7700111014. THIS ITEM IS A USED 2003 MITSUBISHI CARISMA FUEL INJECTOR REMOVED FROM A 2003 MITSUBISHI CARISMA DI-D MIRAGE. VEHICLE GUIDE. Cleveland Auto Recyclers ltd AS SOON AS POSSIBLE. F9Q1 1.9 DCi 0445110021 / 7700111014. THIS ITEM IS A USED 2003MITSUBISHI CARISMA FUEL INJECTOR REMOVED FROM A 2003 MITSUBISHI CARISMA DI-D MIRAGE. VEHICLE GUIDE. Cleveland Auto Recyclers ltd AS SOON AS POSSIBLE. 1460A043 294000-0992;. MITSUBISHI OUTLANDER Injector Pump (High Pressure). 2013 MITSUBISHI OUTLANDER which we are dismantling. OUTLANDER 2007 -2013 Mk 2. Style Station Wagon. The Part imaged and described is th eactual part you will recieve.